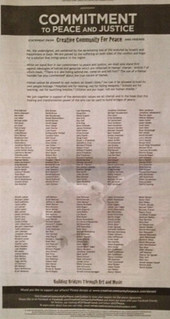 On Sunday, The New York Times featured a full page advertisement on page A7 sponsored by the group Creative Community for Peace (CCFP). The advertisement, which at first glance appears to be a benign call for peace in Israel and a denouncement of terror, was signed by the likes of Seth Rogen, Sarah Silverman, Aaron Sorkin, and hundreds of other entertainment stars. A closer look at the ad reveals its less-than-benign intentions, and a closer look at the group behind the ad, CCFP, reveals that it is actually a front organization for the extremist pro-settler, pro-occupation organization StandWithUs, which is dedicated to laundering Israel’s image and shielding it from critique while demonizing Palestinians. Formed in 2011, CCFP partnered with StandWithUs, a group widely perceived as being on the far right of the pro-Israel spectrum, which accepts tax deductible donations on CCFP’s behalf. CCFP’s founding member, David Renzer, has stated that his group has “always operated independently” of StandWithUs. But the Forward found that, like its partner group, CCFP rejects the U.S. position that settlements are an obstacle to peace and disputes the use of the term “occupation” to describe Israel’s military rule over the West Bank’s more than 2.5 million Palestinians. 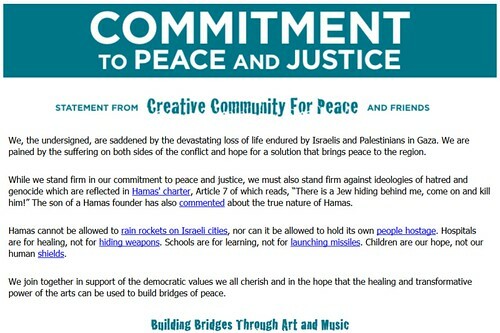 Indeed, even CCFP’s website admits, while hiding behind a veneer of progressive, artistic sensibilities, that its focus is to combat Israel being singled out for critique and boycotts, while highlighting the misdeeds of Palestinians. And this is exactly what the now-infamous NYT advertisement achieved: after an admirable opening sentence, its exclusive focus is to critique Hamas and slander Palestinians as “human shields” while remaining silent about Israel’s actions in Gaza. In short: the advertisement’s underlying goal is to paint Israel as the victim, and Palestinians as the violent enemy, when those who witnessed the massive death and destruction in Gaza know the truth to be, ehem, more nuanced. I wonder if Seth Rogen knows that he was used by a right-wing organization which supports Israel’s settlement enterprise and occupation. 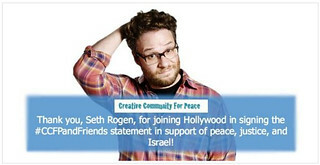 I wonder if he and other liberal entertainers understand that, rather than promoting “peace and justice,” they were instead unwittingly supporting a propaganda program promoted by StandWithUs, which has ties to the Israeli government. Apparently, many did not, which is why we must. For peace will only come to Israel and Palestine when those obstacles to peace are on full display, not whitewashed by right-wing organizations. Hamas terrorism and BDS tend to unite those on the left, right, and center of the pro-Israel spectrum. You mean duped the same way Tikkun Daily “duped” every reader by not disclosing the names of vulture funds and their owner in “Debt Trial of the Century in the Hands of Supreme Court” ? Oh . . . the irony. It is a shonda for Seth and Sarah to support a pro-Israel petition, because it’s sponsors are pro-occupation. This, from someone who repeatedly shows support for BDS, even though he claims not to agree with the BDS goal of abolishing Israel.